1. Supports Windows 95, 98, ME, NT4, Windows 2000, XP, Vista, Win 7 / 8 / 8.1, 2003, 2008, 2012. Print Actual size - prints at the image size regardless if it will fit on the page or not, this will not spawn multi pages per page, the image will be chopped if it's too big. Scale to page - will take the printer settings page size and scale to fit best, either on x or y which ever is the largest. 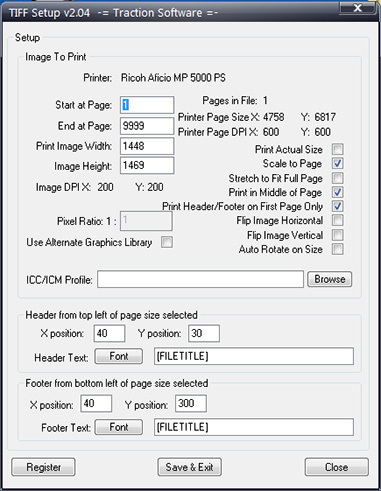 Stretch to fit full page - will stretch the image to fit the entire printer page size selected. Print in the middle of the page - will print the actual or scaled image in the middle of the page x & y. Print header/footer on first page only - if this is selected then the header & footer is only printed on the first page of the document, if not then it will print on every page. Run from the command line using the -Atiff"parameters" option, see FAQ in help for more info.